2012 Keynote Speakers: Brinkley, Cicoria and Clark! 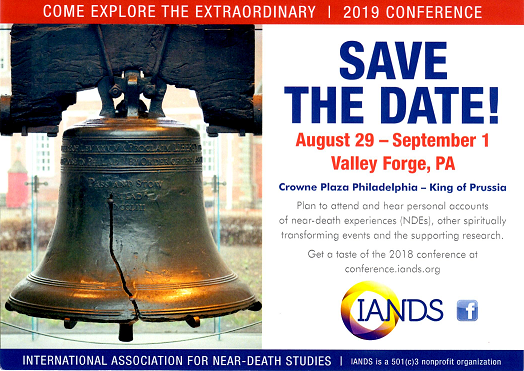 Dannion Brinkley, Tony Cicoria and Nancy Clark will be Keynote Speakers at the 2012 IANDS Conference, Visions: 2012 and Beyond in Phoenix/Scottsdale, Arizona, August 31 - September 2! Dannion Brinkley is an internationally known author and speaker and a three-time near-death experiencer. His deep compassion for those who are suffering comes directly from his own experience of unimaginable pain in his NDEs. During his NDEs, he received prophetic visions, a number of which have been accurate. He is the author of Saved by the Light and the co-founder of The Twilight Brigade, a care community dedicated to being at the bedside of our nation's dying veterans. Orthopedic surgeon Tony Cicoria was struck by lightning while talking on a pay phone in 1994. He experienced many of the elements of an NDE -- out of body perceptions, feelings of peace, love and warmth, a life review -- then was brought suddenly back when a woman administered CPR. Cicoria experienced no lasting neurological or cardiological effects. However, he began to have an uncharacteristic, insatiable desire to hear classical piano music and spent most of his spare time listening to classical artists. He began piano lessons and tried to play a composition he had first heard in his mind a few weeks after his NDE. Every time he would sit at the piano this music would keep playing in his mind. Fourteen years after his NDE, on his 56th birthday, Tony Cicoria played his Lightning Sonata, along with two other pieces he had composed, in a concert performance. Nancy Clark, Ph.D. is a medical intuitive, an international lecturer and workshop facilitator. In 1991, she spontaneously began to see inside the body. Within two months she had begun working with many people who initially wanted a session. Dr. Clark teaches a certified 100-hour course and clinic in "Becoming a Medical Intuitive" to students around the world and, until recently, served on the IANDS Board of Directors. Dr. Clark has a very positive view of the coming changes symbolized by 2012: "There is a reason for optimism! There is a reason to be joyous! Earth and her inhabitants are changing rapidly." Plan your vacation, bring your family: visit the Grand Canyon or Sedona! People who have near-death and near-death-like experiences sometimes report receiving visions of the future. In some cases these are visions of a personal nature that are later proven correct. Sometimes, visions are more general, relating to Earth and humanity. A vision can simply show a possible future or provide a note of caution. Still others are hopeful, showing a very positive outcome for humanity. This Conference will focus on the visions that can give us guidance for the future. NDEr visions can be especially comforting to those grieving the loss of a loved one. There has been a lot of hype around the meaning of "2012". Come and hear what near-death experiencers and NDE researchers can tell us!